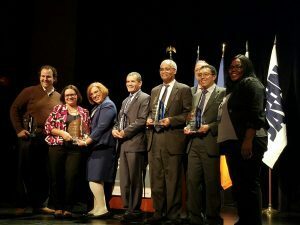 Lehman College was awarded the CUNY IT Innovation Award for technological achievement at a ceremony at John Jay College in early December. Each year, the CUNY IT Innovation Award recognizes a project that is inventive and results in new ways for Colleges to operate. Lehman won for its process automation system. In addition, members of several Lehman offices presented on Lehman 360, iDeclare, TurnItIn, and Accessibility Best Practices at conference workshop sessions. “This award honors our College’s commitment to excellence, recognizes the high quality of our work, and is yet but another example of how Lehman serves as a model for other campus communities—inside and outside of CUNY—who are trying to leverage technology as a means to advance their institutional missions and accelerate progress toward their strategic goals,” said President José Luis Cruz. Since its inception in 2011, Lehman’s automated workflow platform has processed more than 30,000 transactions across more than 15 processes, including electronic course scheduling and the newly developed student declaration of major approval process. “This award recognizes Lehman’s efforts to increase the efficiency of our administrative processes,” said Ron Bergmann, CIO and VP of Information Technology. “Removing friction from the student, faculty and staff experience is a strategic goal, and along with our extraordinary community and beautiful campus will serve to to differentiate the College,” said Bergmann. More than seven Lehman offices have been involved in streamlining and automating the College’s formerly manual processes, resulting in substantial time-savings and increased visibility of a form’s location in the approval system. “The fact that this platform has been adopted by more than six other CUNY colleges attests to its effectiveness,” said Assistant Vice President of IT Edi Ruiz. Elkin Urrea, of the IT division, who leads the automation initiative, was among those honored at the awards ceremony for his service to Lehman. Members of the Library faculty were also recognized for their collaboration with the CUNY Central Office on CUNY Academic Works, a new service of the CUNY libraries. A primary goal of Academic Works is to increase the visibility of CUNY research. The award recognizes the collaborative IT projects that provide benefits to student, faculty, and staff across CUNY.